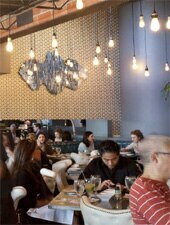 Hip, urban bistro with internationally inspired food. : The original benjy’s still packs them in, both in the downstairs dining room and the upstairs lounge with its patio overlooking Rice Village. Owner Benjy Levit has created a following with his wine list and martinis, but foodies know that the cooking is just as distinctive as the drinks. Try the pistachio-crusted goat cheese with tomato jam and pita chips to start, then consider the seasonal hay-smoked duck served with soba noodles, shiitake mushrooms and bok choy if available. There are local meats, nicely cooked, a few pastas and usually a few vegetarian and gluten-free options. The weekend brunch menu brings old-style biscuits and gravy with Tabasco jelly. And speaking of old-school dining, benjy’s features Sunday supper at an early hour with a three-course family-style menu. Expect fried chicken dinners or smothered pork chops with big sides. And don’t think about leaving without ordering a slice of Levit’s mom’s chocolate cake.